A kind and gentle fairy whose absentmindedness belies her powerful magic. She assists Merlin in teaching Sora and his friends. 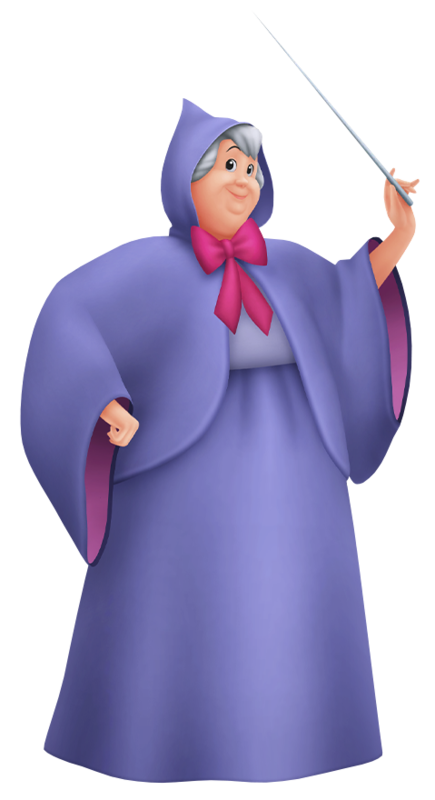 Fairy Godmother was asked by King Mickey to help Sora, Donald, and Goofy after her world was consumed by the Heartless. The three were introduced to her when they met Merlin at his study located beyond the Third District of Traverse Town. She was staying with Merlin in the form of a carriage, but she could easily change into her true form at will. Sora showed her the lucky stone Leon had given him. Fairy Godmother explained that it was a summon gem. When a world is destroyed by the darkness, those with strong hearts could turn into summon gems instead of vanishing with their worlds. She casts a spell on the gem so that the being trapped inside could temporarily regain its spirit and come to Sora's aid. She assures Sora that they will be able to go back home once their worlds are restored. She asks Sora to bring her all of the gems he could find and to help save the poor creatures. She was also very worried about her godchild, Cinderella, but knew she was still alive somewhere. She gives Donald the Lord Fortune staff after Sora learns all of his summon spells. A maternal being with mastery over powerful magic, the Fairy Godmother only appears to those who trust in their dreams. To preserve Cinderella's belief, the Fairy conjures a ballgown, pumpkin carriage and glass slippers for her to attend the ball. The Fairy Godmother reveals to Terra that Cinderella's everlasting faith has caused the light to shine strong and pure within her heart, thus elevating her to become one of the Princesses of Heart. The Fairy Godmother continues to passively watch over Cinderella, but when Aqua prepares to physically confront Lady Tremaine's darkness, she steps in and intervene. Light and darkness cannot be pit against each other, she cautions, as the results of such a battle would be devastating. There has to be a balance, and to maintain this balance, she enlists Aqua to help Jaq free Cinderella from imprisonment. Though Cinderella eventually reaches a happy ending, Aqua is still confused over this new ideology that light cannot be used to defeat darkness. The Fairy Godmother advises her to continue on with her journey, as the lessons Aqua will learn will eventually culminate into an understanding.